Wonderfoam Boat Cleaner is a leading boat cleaner that has become quite popular with boating enthusiats.Since boats are exposed to extreme weather conditions, keeping them clean can certainly be challenging. Boaters and fishermen who are tired of struggling to keep their boats looking good are turning to Wonderfoam to take care of the unique cleaning challenges that they face. What Is Wonderfoam Boat Cleaner? Wonderfoam Boat Cleaner is a relatively new boat cleaner on the market that is able to remove hard water stains and other unsightly markings that come with the general wear and tear of boat use. 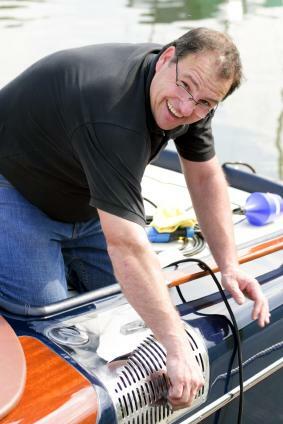 While it is sold along with many other boat cleaners, many people have found it to be superior in getting the job done thorougly on the first try. Wonderfoam safely removes soap scum that builds up on any section of your boat - glass, metal, chrome, stainless steel, and even on the outboard motor. Having one cleanser that is versatile for an entire boat cleaning makes it a winner, as it not only saves time and space, but money as well. Wonderfoam was first introduced to eltiist fishermen at the Won Bass US Open near Las Vegas, and people caught wind of its cleaning capabilities quickly. It was especially noted how it removes calcium deposits with little effort. Wonderfoam is easy to use. Simply spray on the hard-water spots or other water-related staining (such as rust), and wait for approximately 10 seconds. Rinse it off and towel dry. Apply again if the water deposit is still visible. There isn't any external portion of your boat that cannot have Wonderfoam used on it. Use it on your boat hull and then use it on your motor - it doesn't make a difference where you spray, and it can clean every area up in no time flat. After cleaning your boat with Wonderfoam, you'll want to take an additional step toward keeping your boat looking good. Follow up cleaning with Wonderfoam with some sort of protective coating or boat polish - this will keep things looking like new until your next wash.
Wonderfoam can be used to clean things other than just boats. You can use Wonderfoam at home, allowing you more versatility and bang for your buck. Try it on your shower or bathtub, as well as bathroom mirrors, kitchen counter tile, and anywhere else water may hit and make a negative impact. Wonderfoam is also an effective cleaning product for motor homes and travel trailers in addition to working on boats and for various household applications. Wonderfoam is avaialble most readily online. Usually sold in single quarts, you can try a travel hobby store like A-Z RV Products. For a discounted rate, check out Wholesale Marine, which specializes in water sports supplies at low prices. In most instances, this cleaning product is 100 percent guaranteed. If you don't like the way it cleans, then simply return it to your retailer and ask for a refund. However, many boat enthusiasts have sung praises to Wonderfoam for its ability to obliterate even the toughest of grime, and you may find yourself pleased with the results as well.